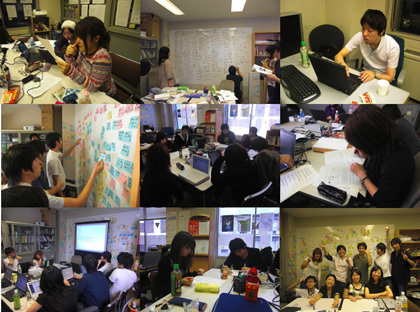 Here we show the information about our research themes and how to apply to Iba Lab, fall semester, 2010. "Creative Systems Lab: Pattern Languages, Dynamic Network Analysis, and Orality Learning"
Orientation for applicants: 5th period in July 8, 2010 (at e12) & 5th period in July 13, 2010 (at k12). Our mission is to create new methods and tools for the future society, based on the latest systems theories and academic methodologies. Note that the systems theories are meant here to "complex systems" and "autopoiesis," and the methodologies are network analysis, pattern languages, and modeling simulations. We are conducting three research projects in the fall semester as follows. Applicants will participate in one of these projects, or launch their own project related to our research theme. This project explores new methods and tools for supporting "creation" with pattern languages. This project explores new methods and tools for understanding the dynamic changing systems with using network analysis. This project explores new methods and tools for learning a foregin language in terms of "orality" rather than "literacy." - Articles and Books by Iba Lab. Seminar meetings are held twice a week: Thuesday 5th period is for discussion on key references and Thursday 5th period is for project review. Grading will be based on seminar participation, contribution to the project activity, and the research results. 1. Be with active and collaborative mind. 2. Enjoy reading, writing, talking in English. 3. Required to buy the key references, for reading them with marking. 4. Do not assign something doing just after the seminars. Sometimes the meeting takes many hours, and often we go out drinking together. 5. Take courses provided by the advisor, Prof. Iba, on the fall semester, 2010: "Pattern Languages" and "Complex Systems." 6. We sometimes invite you to our other academic research projects related to our seminar's theme. We will accept approximately 15 students. 1. Enthusiasm for the research project. 2. Intelligence for thinking deeply on your own. 3. Basic literacy in English. Send the following information to the advisor, iba [atmark] sfc.keio.ac.jp (Prof. Takashi Iba), by e-mail, by July 19th, 2010. We accept the application written in either English or Japanese. Any participants, including auditors, need to register and require the permission of the advisor. 5. Taken Courses provided by the advisor, Prof. Takashi Iba. 7. Why you want to join in Iba Lab? 9. What will be your contribution to Iba Lab?